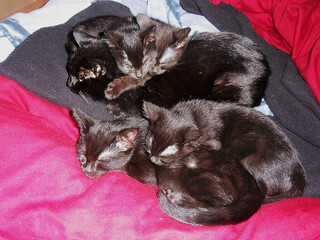 The Fab Five were our second set of foster kittens after the Tumultuous Triad. 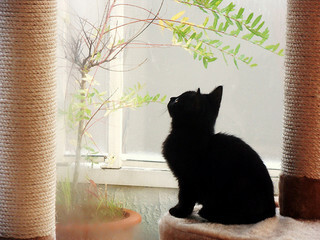 When kittens are brought to a new home, they should be kept within a small space (a bathroom or large cage) for the first few days to ensure good litter box habits, reduce transitional stress, and allow resident pets to get used to the newcomers’ scent before interacting with them. We started the five in a large cage. The tiniest kitten, Freya, shook the bars of her cage and shouted the house down to express her outrage. She yelled so loudly that our twenty-year-old cat, Laya, woke us up in the night to let us know that there was a situation in the office that required attention. The Fab Five also figured out how to slip through gaps in the lower bars, so we had to add barricades for the first couple of nights until we could move them to a new space. 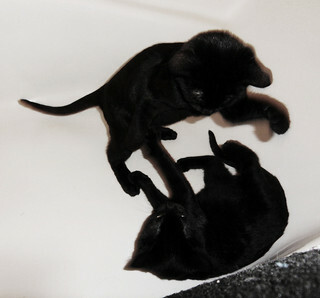 We moved the kittens into the master bathroom the day after they arrived to give them more running room, and they soon began holding cage match playfights in the bathtub. Taking a bath or shower was a challenge because a surge of kittens would pour over the rim of the tub as soon as anyone stepped into it. We soon gave the Fab Five a free run of the office so that they would have enough space to really stretch their legs. They quickly sought to expand their territory throughout the rest of the house, which meant that getting in and out of the office required strategy and athletic prowess. We had to distract them by faking in a different direction and then running out the door ahead of the swarm. Once we were confident that all the kittens were good with their litter box, we let them have a run throughout the entire house. They became obsessed with Laya, spending their days stalking her, inching their way ever closer with the ultimate goal of being allowed to sleep next to her. Laya largely ignored the kittens when they first arrived, occasionally grumbling a bit when they got on her nerves, though she also washed them now and then, albeit grudgingly. She even let them pile on top of her in a heap, but she would evict them if they started fighting with one another on top of her. Laya was very tolerant of the Fab Five. Even when they were at their most obnoxious, the worst she did was growl and smack the wall next to their heads as a warning. She had been very depressed about the recent death of her sister, but the kittens lifted her out of it. At times she was annoyed, but she was no longer bored or lonely. 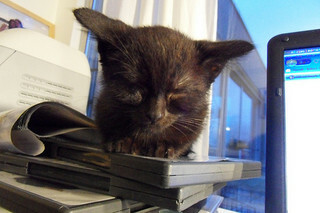 The tiniest foster kitten, Freya, was also the brightest and the most determined to stay. She really understood the situation – that she was here temporarily unless she could bond with Laya. Freya was relentless in her pursuit of Laya, leaping from the arms of people to land in Laya’s bed next to the matriarch. She also watched us continuously with a curious expression on her face but never relaxed with us until she knew that she was staying. Freya’s determination was rewarded. We adopted her and she has since become a foster mother to many litters of orphaned kittens over the past few years. She washes them, hugs them, does the trilling mother call, and even carries them around by the scruffs of their necks. Freya has proven to be extremely intelligent, the sort of cat who will attempt to turn a doorknob with her paws rather than just shoving against a closed door or trying to hook the underside to pull it open. She has also figured out how to slide window screens and turn window latches, so we’ve had to create an elaborate system of window security to thwart her. 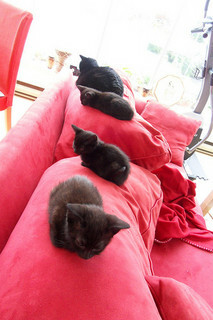 Of the five kittens, three seemed more advanced than the other two when they arrived. Sprocket, Kaya, and Kismet hit all the developmental milestones earlier than Freya and Smokey, which led me to suspect that these three were slightly older. 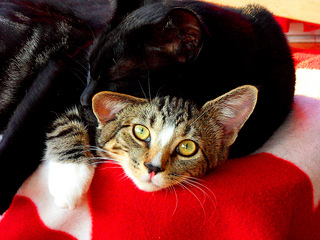 Cats can become pregnant while already pregnant, a phenomenon known as superfetation. 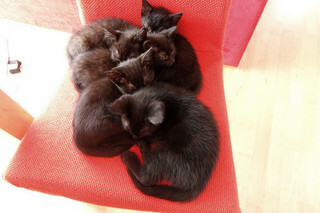 In such cases, the less developed litter will often be born at the same time as the fully developed litter and thus be premature (or they may be born later, placing a significant burden on the mother if the litter is large). I don’t think that Smokey and Freya were very premature, certainly not enough to endanger their lives, but they definitely started from a slightly less advanced stage. 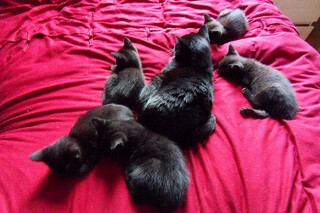 Freya has always been much tinier than her siblings and Smokey took longer to grow into his teen and adult sizes than the other boys, though he ended up quite large. Sprocket, Kaya, and Kismet were easy going and cheerful from the start. They seemed to have no ill effects as a result of separating from their mother (a feral that was adopted into another home). 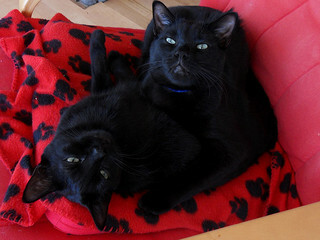 Freya and Smokey were developmentally immature by comparison, but they eventually caught up with their siblings. 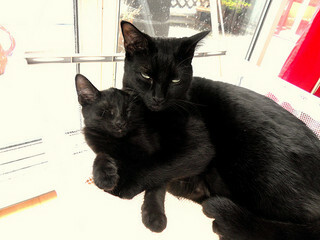 Smokey took the separation from his mother particularly hard. When he first came to us, he hid in his little kitty condo and when we held him, he was the only kitten that couldn’t be calmed. Even gently holding the scruff of his neck, which usually triggers a relaxation reflex in kittens, didn’t work for him, and normal household sounds that the other kittens ignored terrified him. Smokey was phobic of everything–hats, clanging dishes, multicoloured socks (monochromatic socks were fine), and other odd things. The first time he saw me wearing towel on my head, he became crazed with fear (I believe he thought that the towel was eating my head). We had to use systematic desensitization activities to help him overcome his phobias. 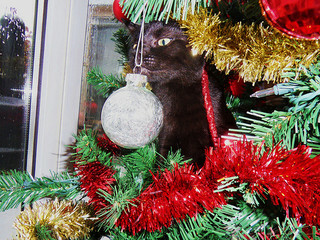 Smokey also had odd habits. 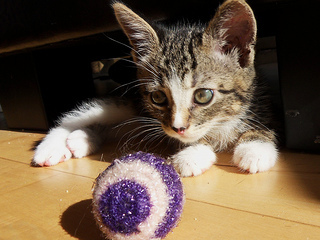 When he played by himself, he would pounce in perfect rectangle or parallelogram shapes for hours rather than engaging in the normal random play of ordinary kittens. He would also happily spend hours watching a computer cursor move along the screen. Smokey didn’t understand normal kitten play. When his siblings tackled him, he thought they were actually trying to hurt him, and he would become terrified and hide. The others quickly realized that he found rough play upsetting. They were a good-natured group and soon stopped tackling him, allowing him to become comfortable with the play at his own pace (he eventually grew to love rough-and-tumble activities). Despite his many fears (or perhaps because of them), Smokey was a kindhearted soul. 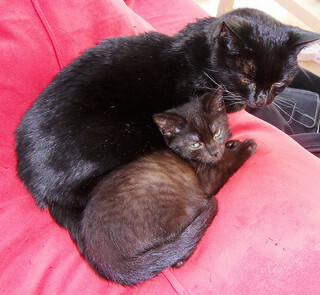 When his sister Freya threw up one day and became very upset and frightened, he put an arm around her and held her until she calmed down. We decided to keep Smokey because we thought he’d have the most difficulty adjusting to a new home. 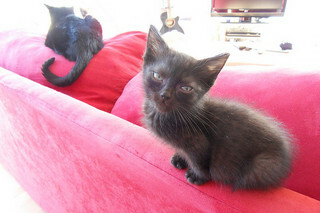 Also, it might have been difficult finding a home for him, given that he wasn’t the most attractive kitten. He had bald eyebrows that slanted down toward the bridge of his nose, making him look evil, angry, or grumpy at all times. His fur was a muddy-looking woolly gray-brown with ghost tabby markings and he had an oddly shaped body (he was like a heavy little brick on skinny legs). As a kitten, Smokey also had some rude habits, such as yanking the food bowl away from the other kittens to keep it all to himself because he was always so hungry (which makes sense, given how big he eventually grew). He even tried to steal treats from Laya, but she didn’t tolerate that sort of nonsense. She placed a paw on his head, pressed him gently down to the floor, and ate the treats around him while she had him subdued. The ugly duckling kitten grew up to be a beautiful swan. 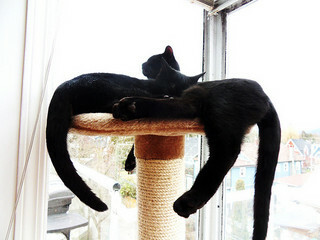 Our little brick turned out to be a whole lot of cat packed into a tiny package, and he stretched and elongated to assume a lean, muscular, panther shape. His woolly fur turned sleek black and he grew into his funny features. He now looks like a jungle cat and everyone who meets him remarks on his stunning appearance. He’s also very athletic and has some amazing moves with the laser pointer. Smokey grew up to be an incredibly nice cat. He overcame his fears and is now a friendly, happy guy who loves to hug with all four limbs, even wrapping his tail around your arm. Smokey seems to remember what it was like to be a frightened foster kitten, because he takes on a big brother role with the kittens we foster now, hugging them, washing them, and playing with them. He even lets them chase him, pretending to be scared, puffing up, and allowing them to catch up to him and tackle him. 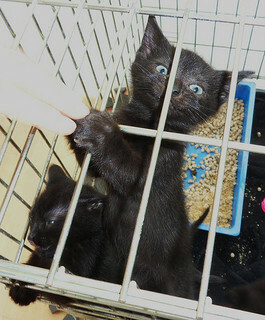 He takes a particular interest in the shy, frightened kittens that need the most help. 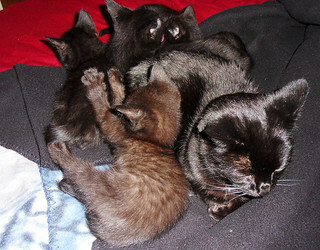 Smokey is physically the strongest cat I’ve ever known, but he can be trusted alone with the tiniest foster kittens. He’s a gentle soul. Even when subjected to trauma (for example, being bathed for fleas), while fighting to get free, he turns his toes upward to make sure that he doesn’t accidentally scratch us while he struggles. 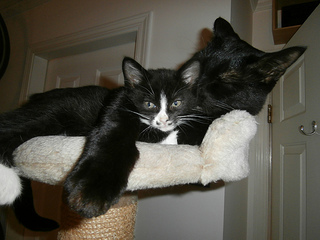 Our experience with Smokey indicates how worthwhile it is to take on an ugly duckling kitten, and that cats can overcome their phobias with support. Freya and Smokey continue to live with us. Laya died at nearly twenty-two years of age, with Freya, Smokey, and several foster kittens to keep her company in her final days. 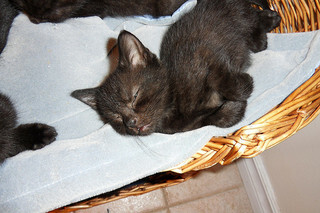 Within days of Laya’s death, we received a call from the adopters of one of our newest foster kittens, Sage. The new owners were devastated because their cat had aggressively rejected Sage. Freya and Smokey were very depressed about the loss of Laya, and they had really loved Sage, so when he came back to us, we decided that we couldn’t put him through another adoption or take him away from our two grieving cats. When Sage returned to us, it was like the sun came out again for Smokey and Freya; their depression lifted rapidly. Sage is essentially Smokey and Freya’s pet, though he loves everyone. He’s an easy going, happy guy, and Freya and Smokey treat him as though he’s their child. His only significant flaw is that he has an eating disorder–he’ll eat anything, so we have to put barriers in front of cupboard doors and hide our gym mats (he eats those too, despite having a clean bill of health and plenty of nutritious food each day; the only food Sage doesn’t get excited about is healthy cat food). 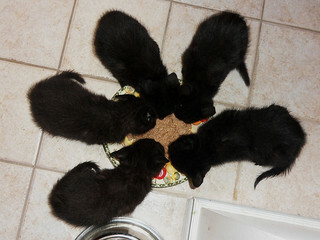 The rest of the Fab Five found happy forever homes. 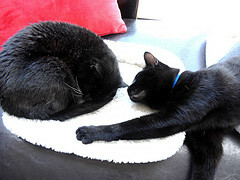 Kaya and Sprocket were adopted together and Kismet was adopted as a companion for an older female cat. 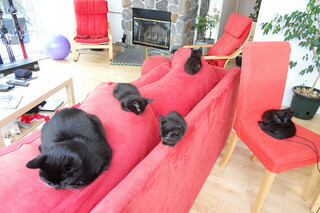 We held a kitty reunion at our place, so we were able to see the Fab Five together as grownups. We attempted photos but ended up with many pictures of people laughing and cats flying through the air (it’s not easy to get five geared-up cats to pose for a photo op). 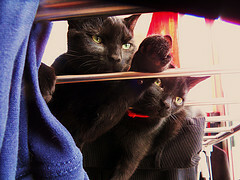 Freya and Smokey are nearly three years old at the time of this writing. They provide lots of entertainment and plenty of laughs. Sage has continued his role as their baby, which keeps him in a permanent state of kittenhood. We continue to foster. 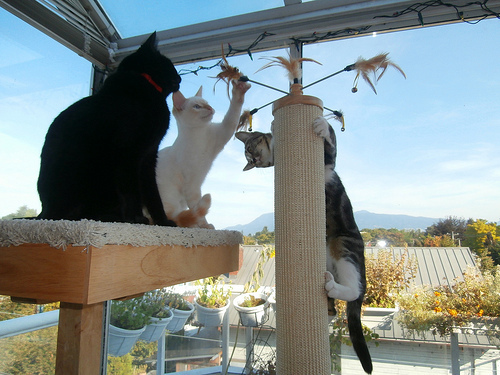 Our three resident cats tend to be a bit hissy for the first couple of days when new kittens arrive (a way of setting boundaries while they assess the newcomers), but they soon get over it. Within a few days, they’re playing happily with the new arrivals and taking on a nurturing, parental role.